Most Americans lived in one-room homes made of logs and rough-cut lumber. Families cooked, ate, worked, relaxed, and slept in a main room called the “keeping room.” Colonial homes were hot in summer and cold in winter—so cold that sometimes the ink on a quill pin would freeze! Folks burned giant logs in fireplaces to stay warm (not until five decades later would Ben Franklin invent the heat-efficient “Franklin Stove”). After a time, a growing family might add an additional room or dormers to their home. Families made their own furniture, but their small houses did not require much. One good chair was usually “father’s chair”; everyone else sat on the floor, on wooden benches, or on a long, high-backed bench called a settle (like a wooden “love-seat” in houses today). Adults slept curled-up on short jack-beds with trundle beds for young children underneath. Older children might sleep in the attic, on mattresses stuffed with straw, feathers, or wool. There were no closets; folks hung their clothes on wall pegs. Since colonial homes had no bathrooms, family members relieved themselves in trenches or rough-built out-houses. As in Europe, bathing was viewed as unnecessary on a regular basis—and in some English colonies, especially in the West Indies, swimming in the clear blue Carribean was viewed as unhealthy. When weddings or special occasions made a bath necessary, however, colonials stood in wooden tubs of water in front of the fireplace. Any dwelling outside of a city had an outhouse, but in all homes—for those times when there was a blizzard or storm—there was a “chamber pot” in which one did one’s business. It was covered by a cloth, and when it got full, it was taken to the window and “flushed” outside. Cities were virtual cesspools well into the 1800s, with any inedible table scraps tossed out the window or into the street. Farmers would bring herds of pigs or goats into town on a regular basis to clean the streets. As noted in a Wild! Did you know . . . , larger cities had a severe dead animal problem, usually solved by contracting with individuals to remove carcasses. These could number in the hundreds per week. Medicine was abysmal, with only morphine available to deaden pain—and that in extreme rare supply. Ordinary procedures, such as pulling a decaying tooth, or removal of anything short of a major tumor, were done without anesthetic. No one knew yet about germ theory, so bleeding was the most common practice to cure ongoing ailments and leeches were in regular use. 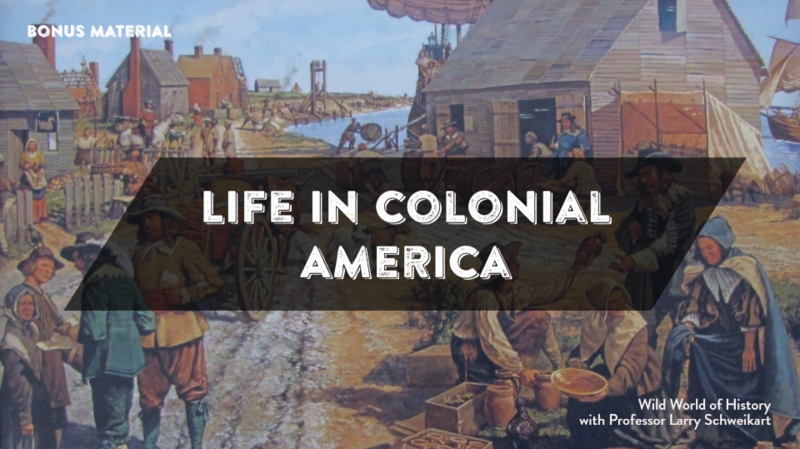 Colonists lived a hard life, despite the romanticized versions we often see in the movies or on television, where day-long, utterly exhausting tedious chores appear to be done in minutes, if not seconds.